Was können meine Gruppe und ich spielen? Was tut man so den ganzen Tag? 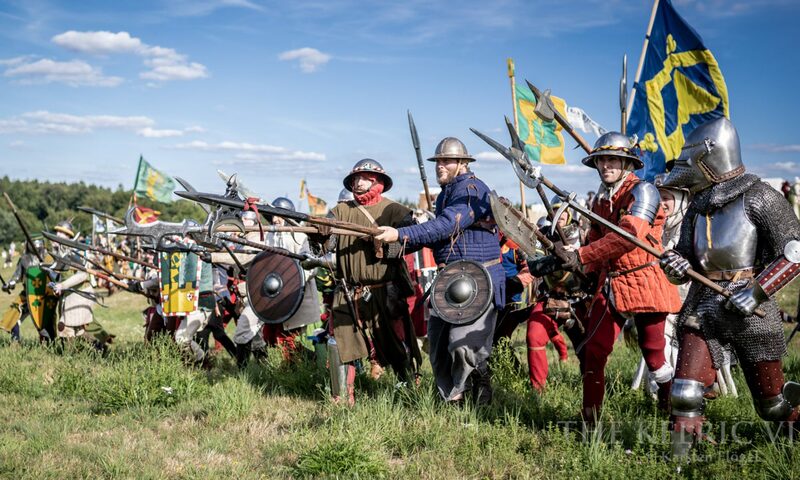 We are a camp for historic inspired LARP-characters from the 13th to early 16th century. Our focus is on deep and intensive roleplay: the reason for every character to come to the Pilgerlager and the connection between them all is their devotion for Saint Clara. Besides the religious and civil aspects of roleplay our second focus lies on military roleplay. Every year pilgrims from all realms and kingdoms come to the holy city of Sancta Clara in Streitland to worship her relics. However the main relic – her grave and body – was never found. The legend sayes, that her grave still is in Streitland and will be revealed to true believers to donor salvation and cure, why every pilgrim (almost excessively) tries to do agreeable actions in the name of Saint Clara to be able to find it. Additionally great parts of Streitland have fallen into the hands of pagan barbarians, orcs and creatures of chaos who all try to extinguish the holy city of Sanct Clara and every memory of the Saint, which every Pilgrim is eager to avoid by his service in the army of the city. What can my group and I play? Every thincable medieval-styled common is welcome in the Pilgerlager, for example Peasants and Craftsmen. Besides their „Job“ everybody in Sanct Clara is liable for military service (or has to pay for a liberation, see more below), so soldiers are welcome, too (in fact a medieval soldier would be able to perform a craft besides the fighting 😉 ). As a player-group of commons you are Part of a Gaffel. To understand the way of organisation and play in the Pilgerlager please read the article about the Gaffeln! The Hospital Of The Saint in Sancta Clara is famous in all Streitland. Every healer-character is warmly invited to take part in the play of the hospital and to be a part of it. In battles the hospital forms a own corps. As a clerical character you are warmly invited to take part in the Cathedral Chapter of Sanct Clara. The Chapter takes care of the salvation of the pilgrims and looks after the famous and much visited Chapel of the Saint with her so far found relics. Second the Chapter is the spiritual half of the council of our leader Provost Haderast, Lord of the city of Sankt Clara and Streitland. Last, every Gaffel (see above) has their own chaplain, who is a member of the chapter. The chaplain is the contact person between the Gaffel and the camp-leadership. In This position a player of a clerical character can take part both in the play of his group and in the play of the chapter! The Knights Of The Holy Chalice Of St. Clara (Kelchherren) are a order to protect the pilgrims and the city of Sanct Clara. They form the secular half of the council of provost Haderast. Furthermore they take diplomatic missions and quests for the provost and fulfill foreign representation of the camp (while „representation“ mostly means to beat up someone 😀 ). On Top of that every Kelchherr is a godfather for one Gaffel (see above). The Gaffel relys on „their“ knight when they need any kind of help which only a knight can give. The other way round the knight should take „his“ Gaffel with him on missions and quests as assistance and rouges. I am single and have no group to attend the convention – what now? For you everything above counts the same: if you are a common you will be put into a Gaffel and take part in their play. As a cleric, you belong to the Cathedral Capter , as a healer to the Hospital and as a knight to the Kelchherren. You’ll never walk alone and will be closely integrated in the camp! In the Pilgerlager are up to four appointments per day, which are mandatory for every player (and his character). The morning devine service (10 a.m.), where afterwards the plans for the day are told and the ranking of the Gaffeln in earning Trophys (see below) is displayed. To stay up to date please check out our news-section. The newsletters contain relevant information about your participation in the Pilgerlager, so please read them carefully! You want to be a part of the Pilgerlager? You are interested in deep and detailed roleplay and want to contribute in the camp to make it a way better experience of LARP for every other player around you? Than be welcome! Here you find the registration-form.